SRCC is a premier institute in the field of business education in India. The College has a rich heritage of academic excellence and achievements in tune with contemporary requirements of the corporate world. It is specifically dealing with issues of management in applied areas of Human Resource, Finance, Accounting, Trade, Marketing and Information Technology in the context of International Business. It is an industry - oriented specialized program in International Business. The University of Delhi awards a PG Diploma in GBO on successful completion of the program. A complete a Bachelor’s Degree from a recognized University with 50% marks. Candidates belonging to OBC, SC, ST & PwD categories are eligible for 5% relaxation in minimum eligibility. Note: Candidates who are appearing in final semester/year of their undergraduate degree program are eligible to take the test. However, admission will be granted only to those eligible/shortlisted candidates who will produce the result of their qualifying degree at the time of grant of admission as per the admission schedule date. In case, a candidate secures less than minimum eligibility marks on the declaration of result, his/her candidature would be canceled. Admission to the course is based on objective type Written Test and Group Discussion & Personal Interview (GDPI). Group Discussion: A group of 8-10 candidates will be given a topic for discussion. Personal Interview: Candidates will be evaluated on the parameters like personality, communication skill and general subject knowledge in management and international business. The written test will be in held in English language. Each of the Test Component will have 40 questions with four multiple-choice answers. Candidates will have to mark one answer in the OMR sheet with ballpoint pen. Each question will carry 4 marks. Full marks will be awarded for the correct answer and 1 mark will be deducted for the wrong answer. The duration of the Test will be 2 hours. The candidate having the valid passport or citizenship card of the other country will belong to the Foreign National Category. These candidates need not to appear for the online test. These candidates will be selected on the basis of this table. Ahmedabad, Bengaluru, Bhopal, Bhubaneswar, Chandigarh, Chennai, Coimbatore, Dehradun, Delhi, Guwahati, Hyderabad, Jaipur, Kochi, Kolkata, Lucknow, Mumba, Nagpur, Ranchi, Shillong and Varanasi. 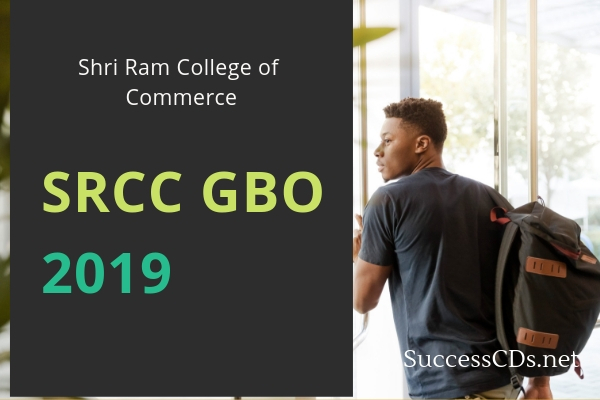 SRCC will start the application form for SRCC GBO 2019. All interested and eligible candidates will have to apply online for admission registration at the College Website www.srccgbo.edu.in or from the direct link will be provided below. Candidates should carefully read guidelines given in the Admission Portal before submitting the online application. Click on “Admission to PGDGBO Batch 2019-21” link at the homepage of the official website or on the link will be provided above. Here, fill the details to register for any program. You must have a valid email ID for applying online. Press the button “Register”. Fill the details on the online application form. After that, you can upload the photograph, signature. Finally, pay the application fee. Submit application form when everything is done.